Great article from houzz.com provides some great design tips on selecting the right mirror for your personality and design style. Below are some tips on how to select the mirror that best complemenets your bathroom decor. Size - Choose the mirror that creates balance as well as functunality. 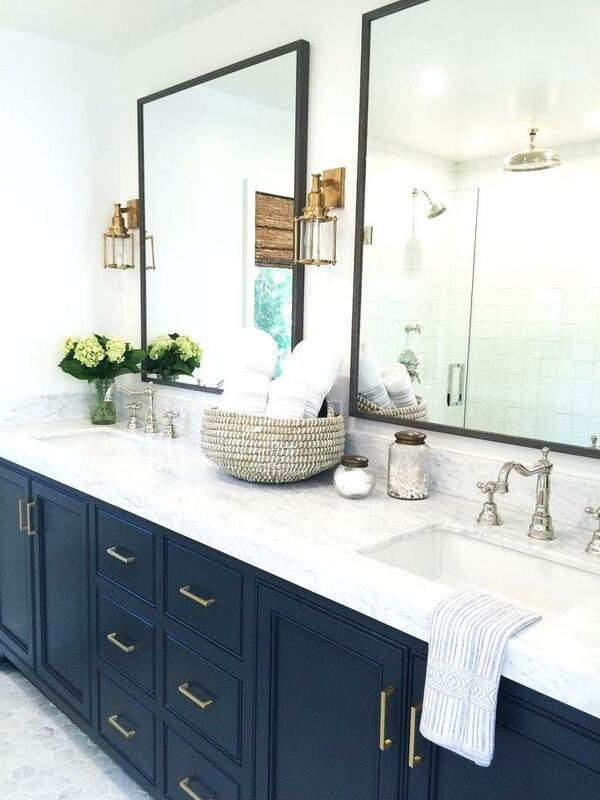 A common rule of thumb is that the mirror be 80-100% the width of the vanity. The more height the better, but make sure it is at least one foot above the height line of the person using it. Single vs. Multiple - A large mirror can create the illusion of space by reflecting the light from the room. Tall vertical mirrors can emphasize height and multiple mirrors can provide balance to the design. Sconces - Lighting can be both beautiful and functional. Sconces can be attached on either side of the vanity mirror or directly on it to create a relection as well as a light source. Wall-to-Wall Mirrors - Go large, wall-to-wall and vanity top to ceiling. What an impact a mirror can make! Great idea in smaller bathrooms to make them appear bigger. Framed vs. Frameless - A framed mirror can feature your design style, whether it is a seashell frame at the beach house or a victorian frame in your master bedroom retreat, it adds a little of your personality. Inset Mirrors - For a clean contemporary look you can inset the mirror into the tile so it is actually framed by the surrounding material. Add some floating shelves for that extra design twist. Round Mirrors (or other shaped mirrors) - A round or arched mirror can create a unique style in your bathroom. A round or curved mirror is oftern used over a pedestal sink to eliminate "negative" space. Medicine Cabinets - Best if they are inset into the wall so they do not extend into your viewing space. Lighting can help create an airy space. Suspended Mirrors - Great option if you have windows are another obstacle where you want to hang the mirrors. Suspend them from the ceiling in front tocreat a real design focal point, while still providing the function of the mirror. Looking to have a new mirror installed in your bathroom. Give Frank's Glass a call at 513.829.8284 to schedule a free measure. We can custom cut it to meet your requirements so you have the perfect mirror, one that is a reflection of your design style!